In front of the Bolshoi Theatre! The view from the overlook - note that we were still pretty close to the city centre. That's the Cathedral of Christ the Saviour, the Red Square, and St Basil's Cathedral in the background. Well, it’s been a whirlwind of a first week! From the moment I touched down in Moscow on Saturday afternoon, I don’t think I’ve stopped moving! My first chance to see Moscow on a personal level came almost as soon as we checked into the hotel. After dinner on Saturday night, one of our Russian buddies, Polina, took two of us on a walk through Sokolniki Park. The park was fairly lively, with children biking and families eating or just buying ice cream for the walk from the many stands lining the main pedestrian walkways. We stayed in the most developed area of the park, with shops, an amphitheater, and large paved paths, but further in the park has many spaces for sports and eventually turns into forest. 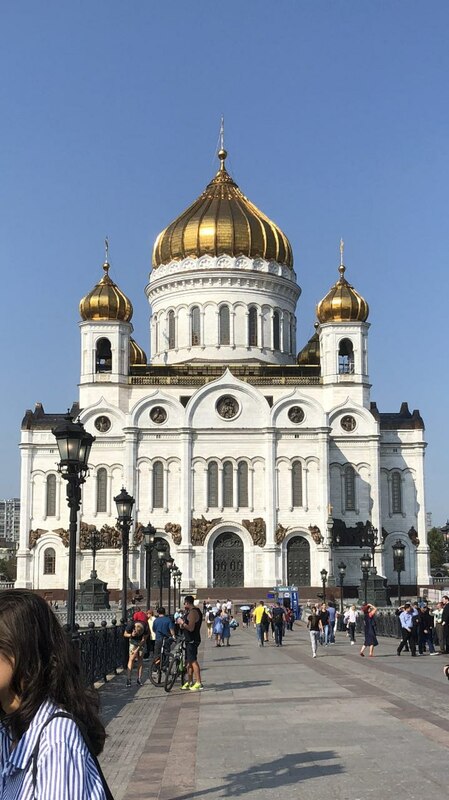 On Sunday, we took a bus tour all around Moscow to see the sights. My favourite was the Cathedral of Christ the Saviour, the tallest Orthodox cathedral in the world. We were lucky enough to come during a service (unfortunately, no photography was allowed) sung in both Old Church Slavonic and Serbian, as one of the priests there that day was Serbian. The hidden choir sounded angelic, and the priests’ vocal ability and command was impressive. The church itself was beautiful as well, gilt and covered in icons of saints. Exterior of Christ the Saviour. The one thing that really struck me from the tour was all the green space Moscow has. 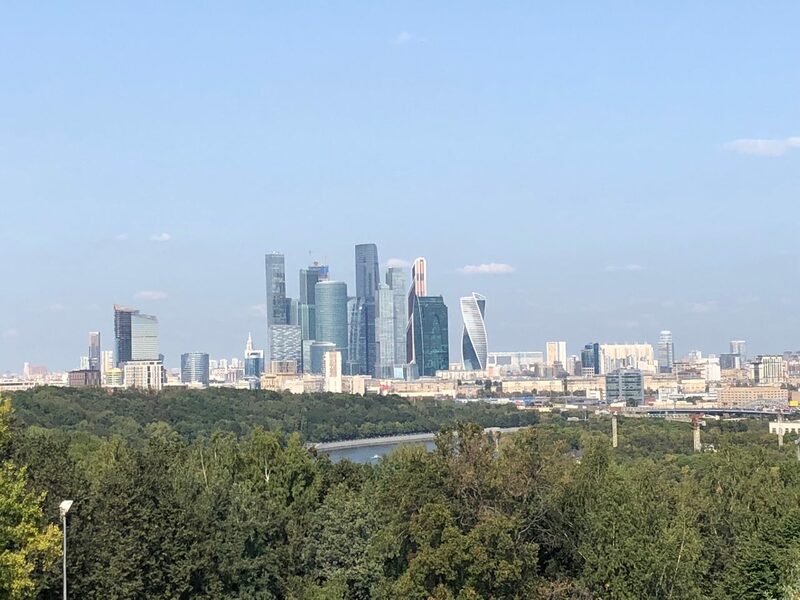 Across from one of the main Moscow State University buildings, we went to an overlook that provided a view of much of the city. Swaths of green forest and park cut across so much of the city in a way that American cities would almost never have. Sunday night, we went to a classic Soviet restaurant near the Red Square. Because our group was fairly large, we got to eat in the private room, which was decked out just like an old Soviet office complete with a giant portrait of Leonid Brezhnev on the wall. I ordered fried вареники, which were dumplings filled with potatoes and cheese, and блины with condensed milk. I would show y’all, but unfortunately I was so hungry that I dug right in without taking any pictures! Rest assured, however, it was delicious. On Monday, we moved into the MGIMO dorm and learned more about the university. My roommate is on the same program I am, although her Russian is definitely better than mine. Nevertheless, we’ve been getting along very well. While our dorm room is small (as expected), we have so much shelf and closet space that we don’t know what to do with it! Tuesday was our first day of class! I woke up bright and early and got ready for my first class at 9 AM – Politics and Security in Post-Soviet Eurasia. 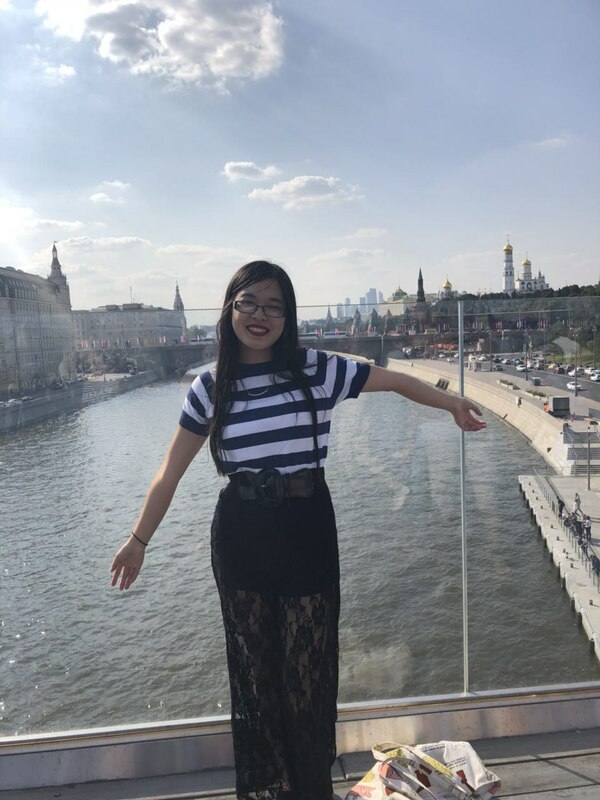 Because exchange students at MGIMO shop around for classes for the two weeks before the add-drop deadline, it’s always a tossup as to how many students will attend each class. That morning, my first class switched rooms twice (and threatened a third move) before we found one that fit all the students! The process ate up almost half an hour, so the lecture was shortened to fifty minutes. However, it was still a fascinating and engaging class period. The other classes that I’ve attended so far were similar – slow starts but interesting lectures (in English, of course). 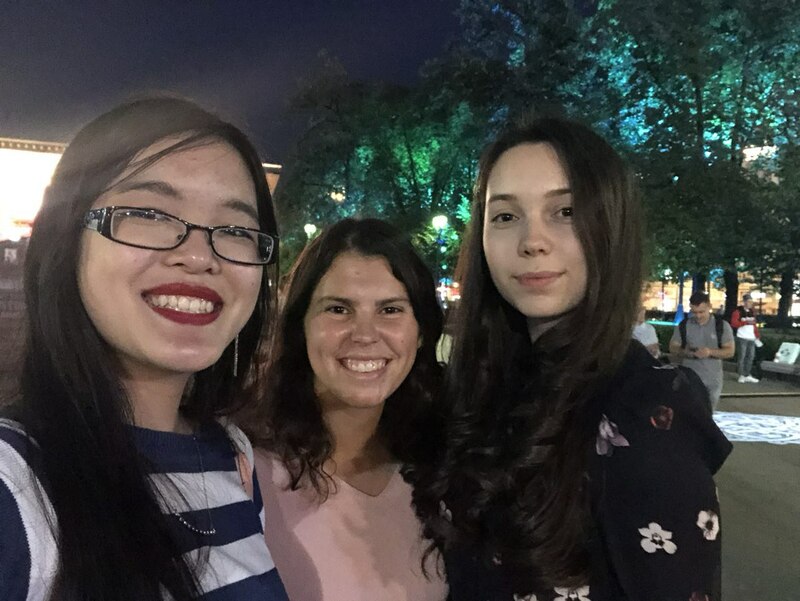 On Wednesday morning, three of us navigated public transport by ourselves and went to Капитолий Вернадского mall to buy some breakfast food and much-needed supplies. It took us a bit to figure out the paying situation (a cashier scanned our items but we paid at a kiosk and then scanned our receipts to leave) and by the time we were done, we were starving. Luckily, there was a food court on the top level of the mall, and I found a cute little pho place! The cashier took one look at me and gave me the Chinese version of the menu, which was helpful as I understood slightly more of it than I would have the Russian version. I had one class early Friday morning and then went to the city center to explore with my roommate. 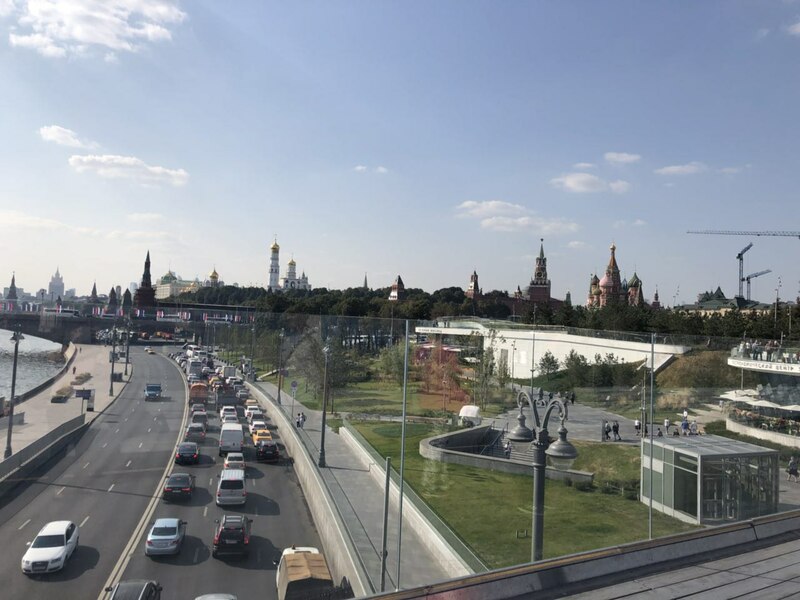 We first went to a newly-opened park near the Red Square that had an overlook jutting out over the Moscow River. Afterwards, we went to ГУМ, a large high end shopping centre just across the street, known for its мороженое, or ice cream. We didn’t buy anything (well, I bought a cinnamon bun from Гастроном No 1 because it smelled so good and was also only 55 rubles) but we had a lot of fun walking around and window shopping. For dinner, we met up with a friend from Uzbekistan who we had met on our first day of classes at MGIMO. 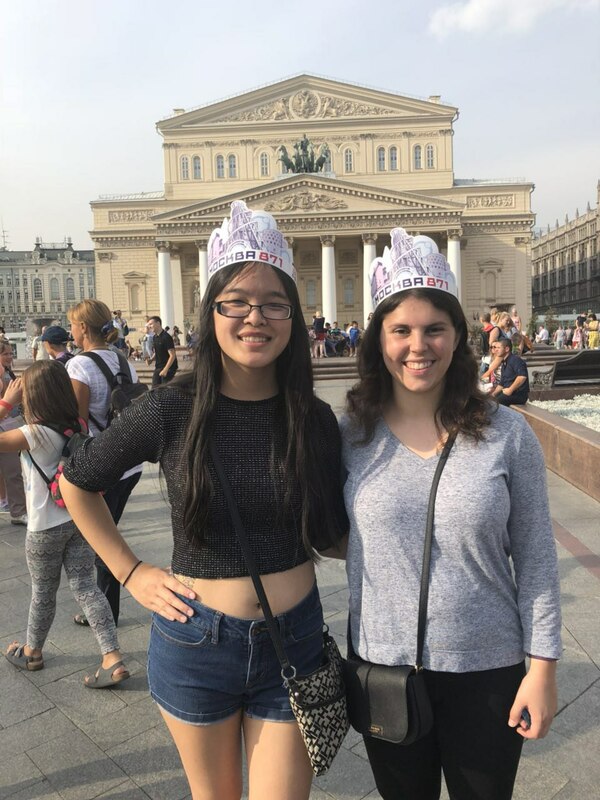 Stella has lived in Moscow for a few years and was excited to show us around, provided that we told her all about life in America. Stella is also very familiar with all the best restaurants in the city, and we’re super excited to continue the friendship! Saturday was the start of Moscow City Day festivities! Every year, Moscow celebrates its founding during the first weekend of September. This year, Moscow turns 871 years old. We went back into the city to participate in the fun. The entire centre was so crowded, and everywhere we looked we saw something new. There were pop-up stands selling various handicrafts, innovators at the Maker Faire, and the ubiquitous ice cream vendors. We walked along Tverskaya Street, which was closed off for pedestrians and featured dance performances and live music. So far, I’ve figured out how to order food pretty coherently and navigate the metro system (MGIMO itself is a bit harder, in all honesty.) My Russian still isn’t up to speed but I’m sure that will change once I actually start my Russian classes on Monday. The classes have all been pretty good, however, and most of them have an almost equal proportion of exchange versus bachelor’s program students. The one thing that’s really hit me is how much we’ve been walking. I’m making it my goal to get out of the MGIMO universe and into the city once every day, and the consequence is that I’ve been walking maybe five times more than I would be at home. It’s pretty tiring, and we’re always going to bed early, but Moscow is so beautiful and every corner brings something new. Alright, this has been a long one, but thank you so much for reading!